Join us for a sneak peek at this year’s holiday tours, festive merchandise, and exclusive events! 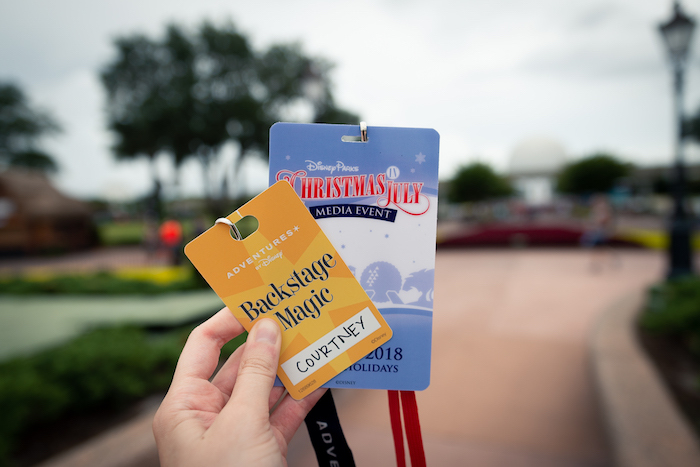 Backstage Magic personalized guest pass / Christmas In July media event guest pass. Photo by Courtney Reynolds. 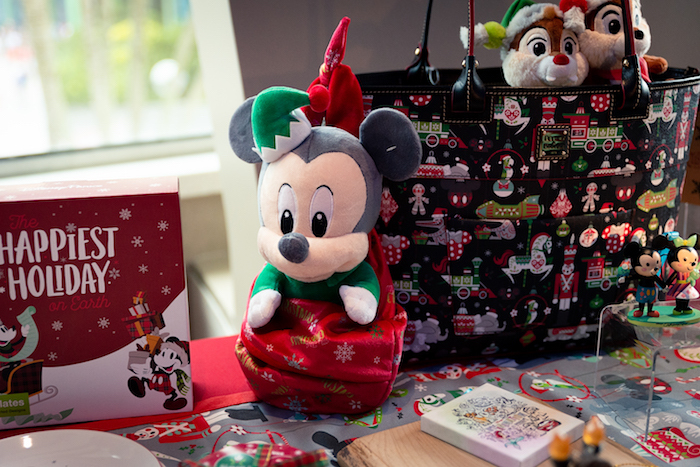 First, we would like to thank Disney for inviting us to the Christmas In July media event so we could bring you this sneak peek! The media event was essentially split up into two parts. 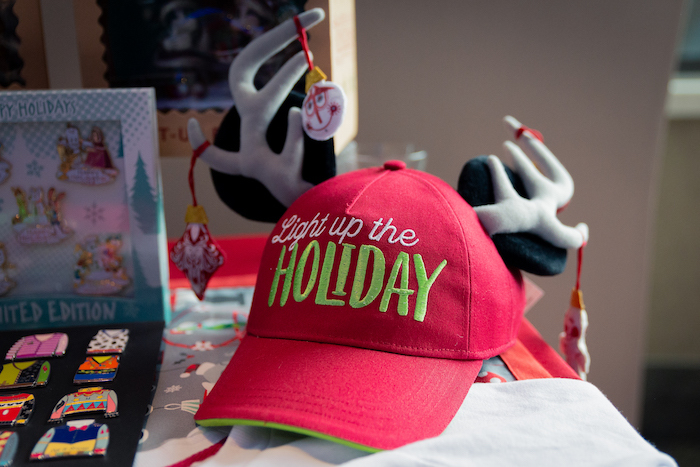 In the morning, we had a chance to preview two holiday Backstage Magic tours that Disney will be offering this winter. 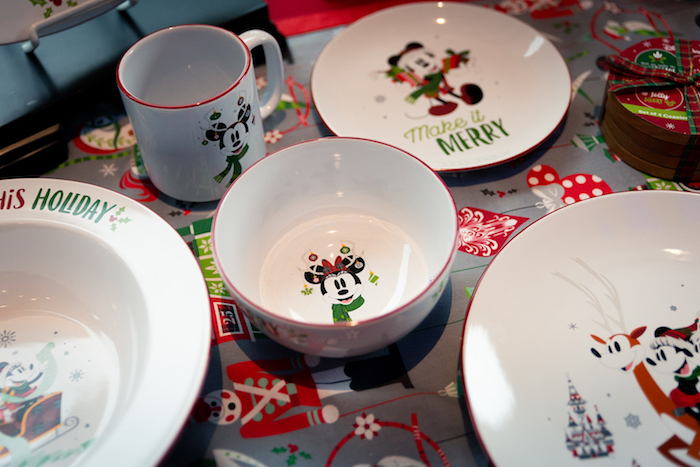 In the afternoon, we were given a sneak peek at new and returning holiday food, merchandise, and events for the 2018 holiday season. Let’s dive in! To begin our tour, we met our two tour guides at Epcot and immediately boarded a bus to make our way to the backstage areas we would be touring. The bus was nicely decorated with ornaments, garland, and a Yule log on every overhead TV. Christmas music played as we boarded, which really helped get everyone in the holiday spirit! During the drive, our tour guides kept us entertained with Walt’s Christmas stories and some Disney holiday trivia. Since the tours take place in backstage areas, unfortunately we were not allowed to take any photos along the way. I will do my best to explain the tours without giving away all the fun secrets you’ll learn. There are a few areas where your tour guides will be able to take some photos of your family so you can have a little memento of your tour. I will sprinkle them throughout this article so you can see what they look like. Photo op during the Holiday D-Lights tour. Photo by Adventures By Disney. First up is the Holiday D-Lights tour! This is a 6-hour tour which gives you a glimpse of how your favorite Epcot and Magic Kingdom holiday traditions are brought to life. This tour is $279 per person (plus tax) for guests 12 and older. 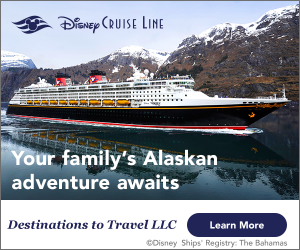 If you are an annual passholder or DVC member, be sure to take advantage of the discount! The tour even includes a family-style barbecue dinner at Whispering Canyon Café at Disney’s Wilderness Lodge. Yum!! Afterwards, you’ll go backstage at the Magic Kingdom and meet the Events & Decorating Support team where you’ll learn all about how Cinderella’s Castle is transformed with over 300,000 holiday lights each year. To cap off your night, you’ll have a chance to see the Epcot Candlelight Processional and a special holiday rendition of Illuminations: Reflections of Earth, all while learning so many cool behind-the-scenes secrets from your tour guide! This tour runs on select nights from November 26th through December 20th so make sure to purchase tickets in advance. 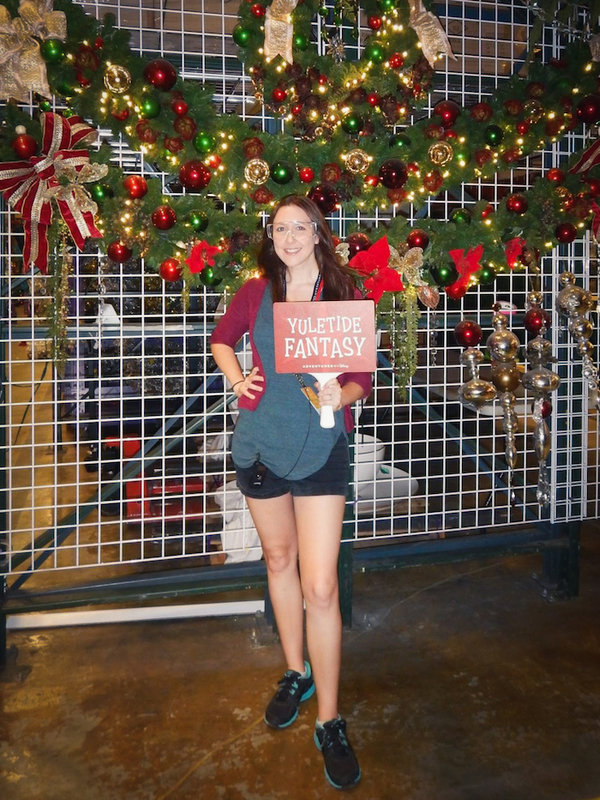 Photo op during the Yuletide Fantasy tour. Photo by Adventures By Disney. Next is the Yuletide Fantasy tour! This is a 3.5-hour tour which explores how Walt Disney World Resort transforms into a winter wonderland each holiday season. This tour is $139 per person (plus tax) for guests 12 and older. Don’t forget about the annual passholder or DVC discount! On this tour, you’ll go backstage at the Magic Kingdom to visit the Holiday Services building, where all the Christmas decorations are stored throughout the year. You’ll learn all about how the decorations are organized and maintained during the off-season. 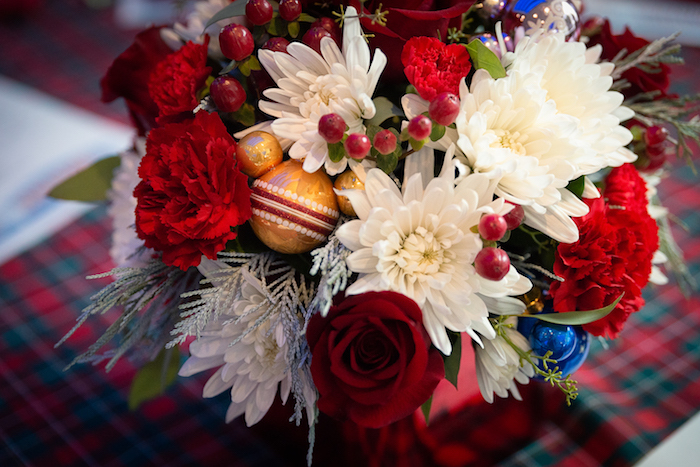 Your next stop will be Disney Floral & Gifts, where you’ll get a behind-the-scenes look at how Disney creates special floral arrangements and displays for the holiday season. Your final stop on the Yuletide Fantasy tour is Disney Springs for a special holiday activity at Amorette’s Patisserie! Since it’s still summer time, none of the holiday treats were ready for us to see during the media event. However, we did see some concept art for some of the upcoming holiday treats including a holiday candle petite cake, seasonal macarons, holiday postcard themed shortbread cookie, and holiday-themed cake decorating classes. This year, the pastry chefs will be focusing on “holiday spice” flavors so be on the lookout for some new yummy treats later this year! Amorette’s Patisserie. Photo by Courtney Reynolds. 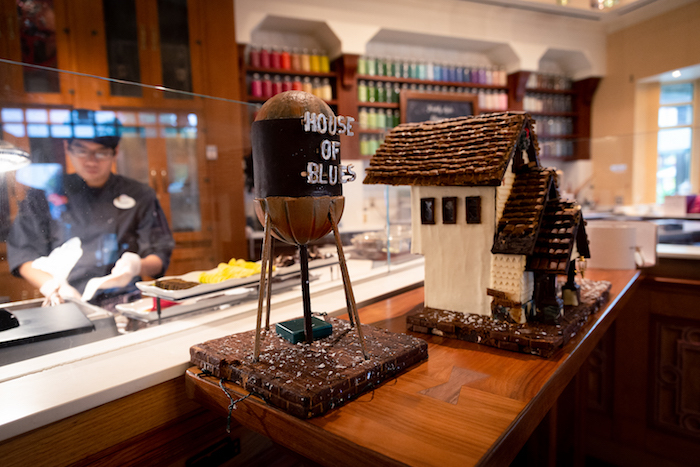 Pieces from last year’s Disney Springs Gingerbread house created by Amorette’s Patisserie. Photo by Courtney Reynolds. By now you’re probably wondering what the special holiday activity is that I mentioned earlier. Well, I can’t tell you! What I can tell you is that during our tour we decorated unicorn macarons. Your activity will be something similar but it will be holiday themed! 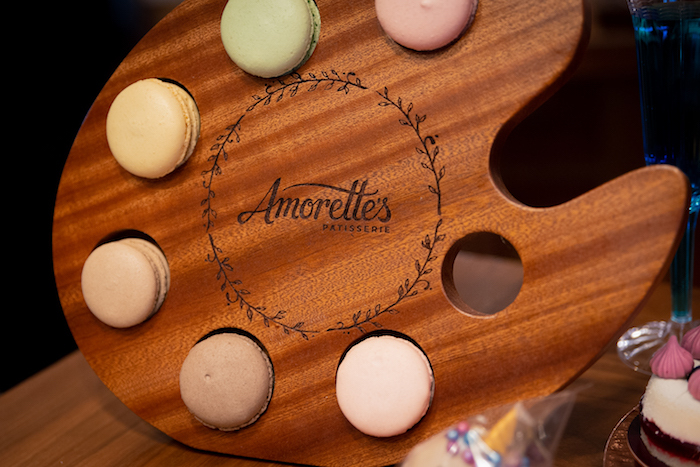 Amorette’s provided the ingredients and tools while the pastry chefs gave step-by-step instructions on how to decorate our macarons. 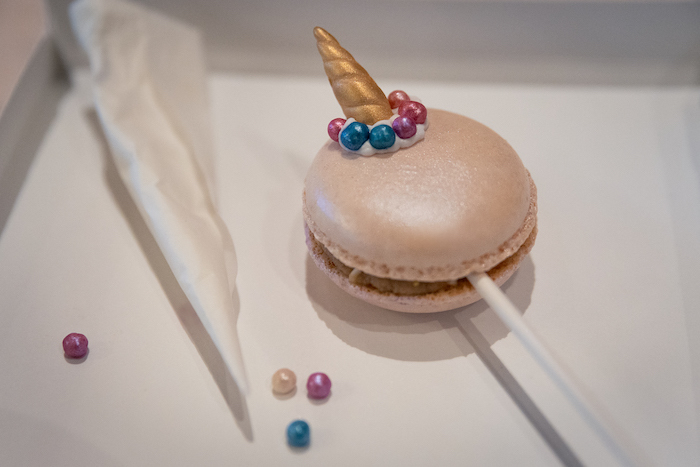 Decorating unicorn macarons at Amorette’s Patisserie. Photo by Courtney Reynolds. That is the end of the Yuletide Fantasy tour! This tour runs on select nights from November 19th through December 29th so make sure to purchase your tickets in advance. One last tour that I would like to highlight is the Garden of the World tour. We didn’t have a chance to preview this tour but they did give us some info that I’d like to pass on to you! The Gardens of the World tour (Spring Edition) is offered during the Epcot Flower & Garden festival and focuses on the role of landscaping at Walt Disney World Resort. Learn how the Flower & Garden topiaries are made, and how you can apply these landscaping techniques at home! The Gardens of the World tour (Fall Edition) is offered during the Epcot Food & Wine festival and focuses on sustainable agriculture all around the globe. Learn about the edible plants from each country in World Showcase, and how to use these growing techniques at home! This tour is $85 per person (plus tax) for guests 12 or older and is offered on select dates throughout each festival. 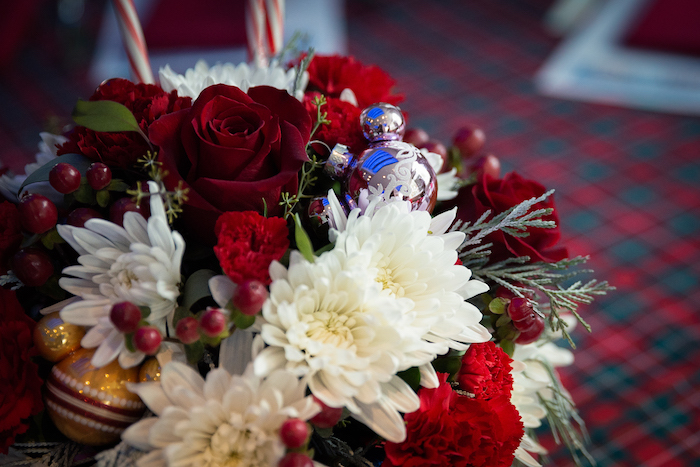 Table centerpiece from the Christmas In July media event. Photo by Courtney Reynolds. 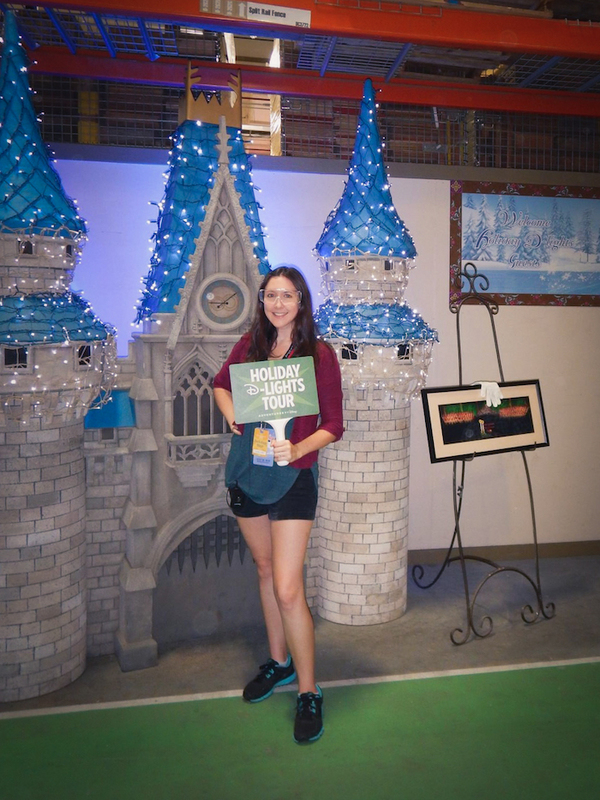 After our tours, we went back to Epcot for the second half of the Christmas In July media event. 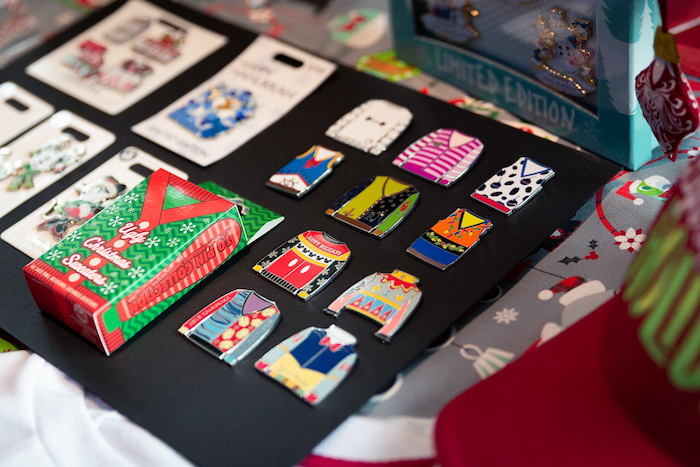 During this section of the event we had a chance to learn all about what’s new and returning for the holiday season. Chelsea Florig (Food & Beverage Project Manager, Epcot) and Crystal Saunders (Pastry Sous Chef, Epcot) showed off the new Maple Bûche de Noël that will be featured at the Epcot Festival of the Holidays. 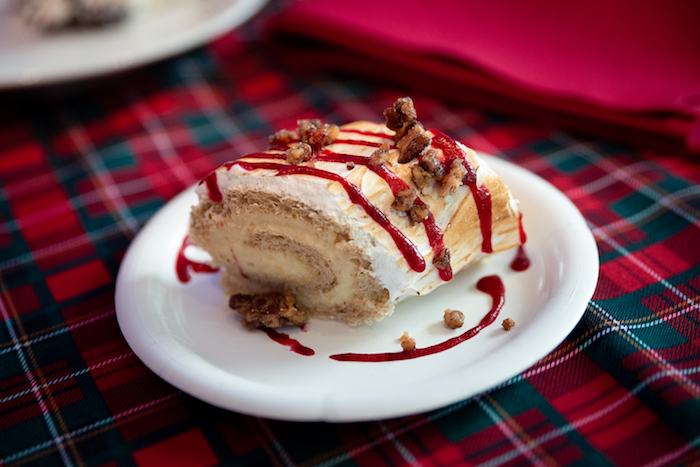 This is a maple mousse rolled in a gingerbread chiffon cake with cranberry sauce and pecan crumble. It will be featured at the Yukon Holiday Kitchen booth. I had a chance to try this dessert and it was delicious! The gingerbread chiffon cake was so light and fluffy and was packed with a nice holiday spice flavor. The maple mousse added a subtle maple flavor and the perfect amount of creaminess. The cranberry sauce was tart but added the perfect amount of acidity to the dish. The pecans, of course, added a nice crunch. I really enjoyed this dessert and I look forward to seeing it on the menu during the holidays! Maple Bûche de Noël will be a new holiday treat at the Epcot Festival of the Holidays. Photo by Courtney Reynolds. Next up was the Disney Parks Live Entertainment team! Marsha Jackson-Randolph (Entertainment Show Director, Epcot), Tom Vazzana (Entertainment Show Director, Hollywood Studios), and Denise Case (Entertainment Show Director, Magic Kingdom) gave us the scoop on what’s new and what’s returning to the Disney Parks holiday entertainment line-up this year. The Epcot Festival of the Holidays will be returning November 18th through December 30th. There will be some new Holiday Kitchens this year. Your favorite Holiday Storytellers Around the World will be returning so be on the lookout for Mr. & Mrs. Claus, Father Christmas, Père Noël, and Julenissen. Joyful: A Celebration of the Season will perform on the Fountain Stage once again, and will feature some new music highlighting Kwanzaa. The Candlelight Processional, of course, will be returning with some new narrators along with some returning favorites! Flurry of Fun will be returning to Hollywood Studios starting November 8th. Jingle Bell, Jingle Bam will be returning for its third season. Sunset Seasons Greetings is also returning but will be amped up with the addition of LASERS. Lasers are being added to the top and mid-section of the Hollywood Tower Hotel and will fly overhead to light up the snow on Sunset Boulevard. It was also announced that Toy Story Land will have a Christmas overlay which will include decorations and a Christmas soundtrack to the Alien Swirling Saucer attraction. A Frozen Holiday Wish will be returning to the Magic Kingdom to light up Cinderella’s Castle each night during the holidays. Mickey’s Very Merry Christmas Party will be returning starting November 8th. The party will feature many returning favorites such as Mickey’s Most Merriest Celebration, A Totally Tomorrowland Christmas, Club Tinsel, Holiday Wishes, and Once Upon a Christmastime Parade. Rumor has it there will also be a NEW dance party announced soon. Phew! 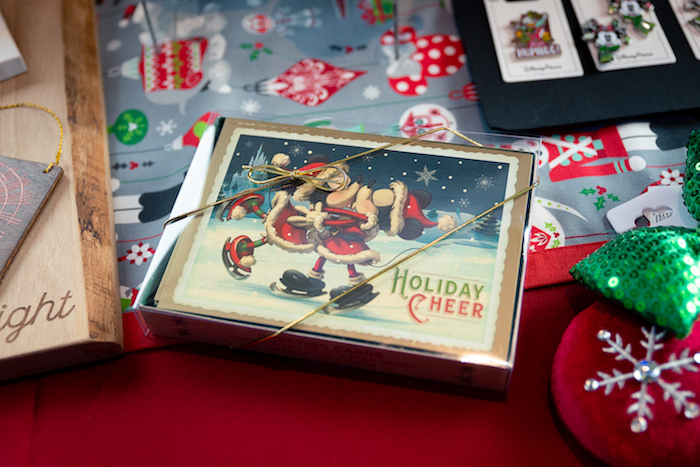 There’s a lot of holiday excitement coming our way this year, but we’re not done yet! Next, we heard from Steven Miller (Merchandise Communications Manager, Disney Theme Park Merchandise). Steven spoke to us about this year’s new “Nordic Winter” theme. You will find this theme throughout a lot of the new merchandise. Instead of me trying to describe it, why don’t I just show you instead? 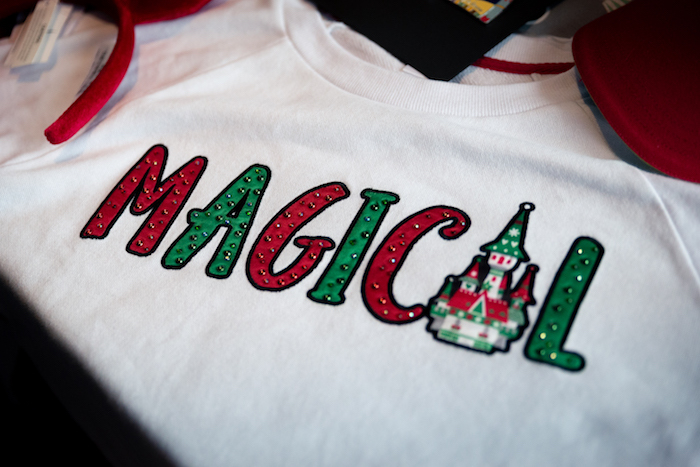 This is just a sampling of the new holiday merchandise. There’s still more to be revealed as we get closer to the holiday season! 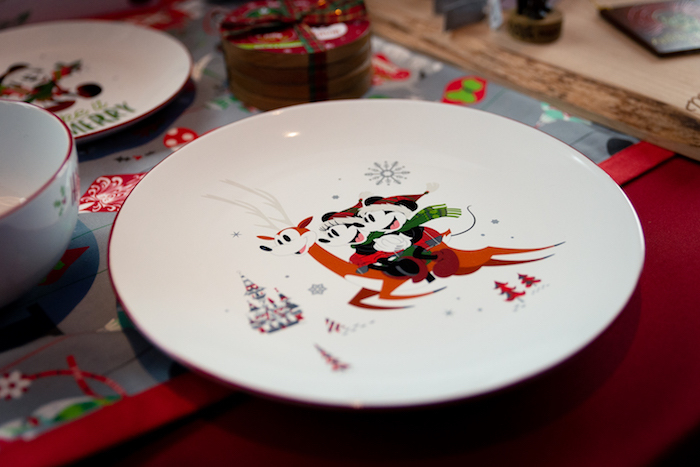 New “Nordic Winter” tableware design. Photo by Courtney Reynolds. New resort-themed holiday ornaments. Photo by Courtney Reynolds. 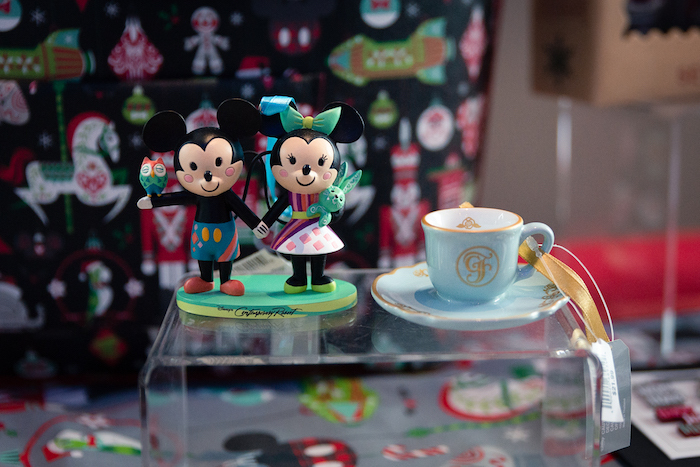 New holiday card design featuring Mickey and Minnie. Photo by Courtney Reynolds. 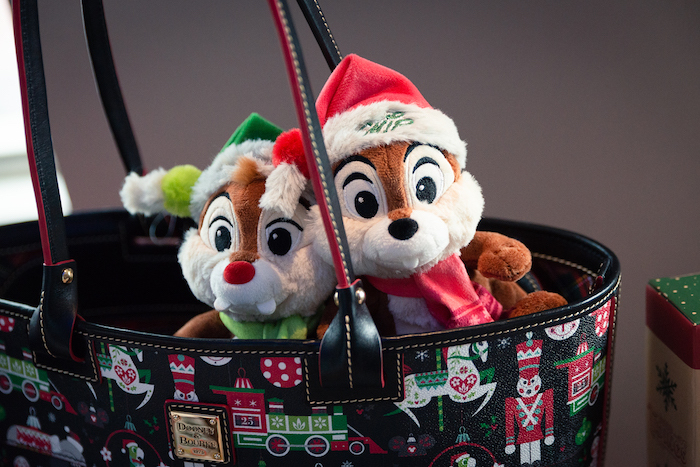 New Dooney & Bourke holiday design and new character plush. Photo by Courtney Reynolds. 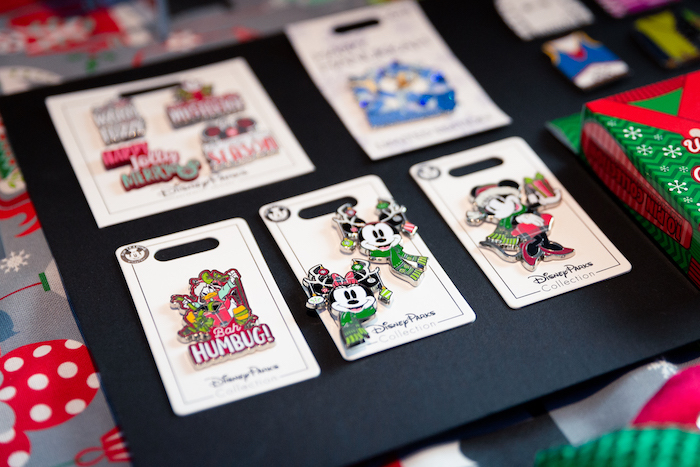 New holiday pins and mystery pin sets. Photo by Courtney Reynolds. New holiday hats and apparel. Photo by Courtney Reynolds. Disney Springs will be joining the holiday fun again this year with new additions to the Christmas Tree Trail! 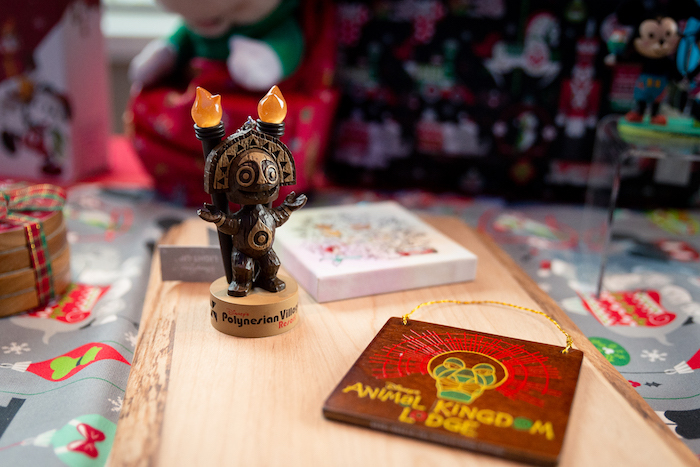 Darcy Clark (Marketing & Sales Strategy Manager, Disney Springs) announced that the Christmas Tree Trail will feature five new trees this year: A Star Wars tree, a Haunted Mansion tree, a Parks tree representing all four theme parks, a “Nordic Winter” tree, and a Mickey & Minnie tree. She also noted that Santa Claus will be back at his special meet-and-greet location along the Christmas Tree Trail. The last guest speaker was Jay Sanderson (Assistant Animal Operations Manager, Tri-Circle D-Ranch) who spoke to us about the return of the Holiday Sleigh Rides at Fort Wilderness Campground. Sleigh Rides will be offered from November 23rd through December 30th for $84.00. Since this is a very popular offering, reservations are recommended! 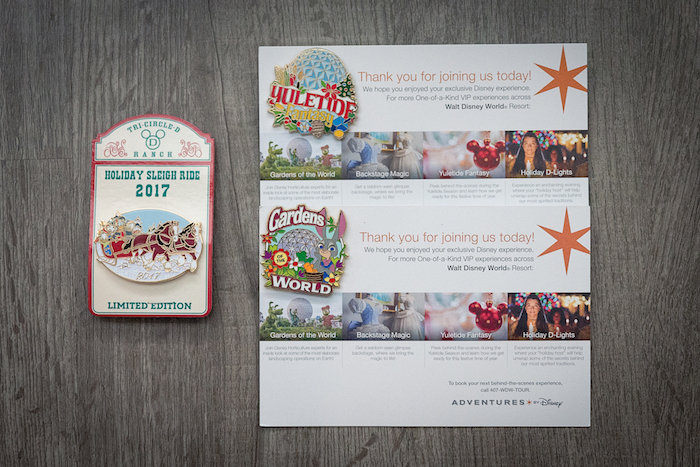 You’ll receive a commemorative pin for the Holiday Sleigh Ride, Yuletide Fantasy tour, D-Lights tour (not pictured), and Gardens of the World tour. Photo by Courtney Reynolds. I hope you are as excited as I am about Disney’s holiday line-up this year! Let the holiday countdown begin! 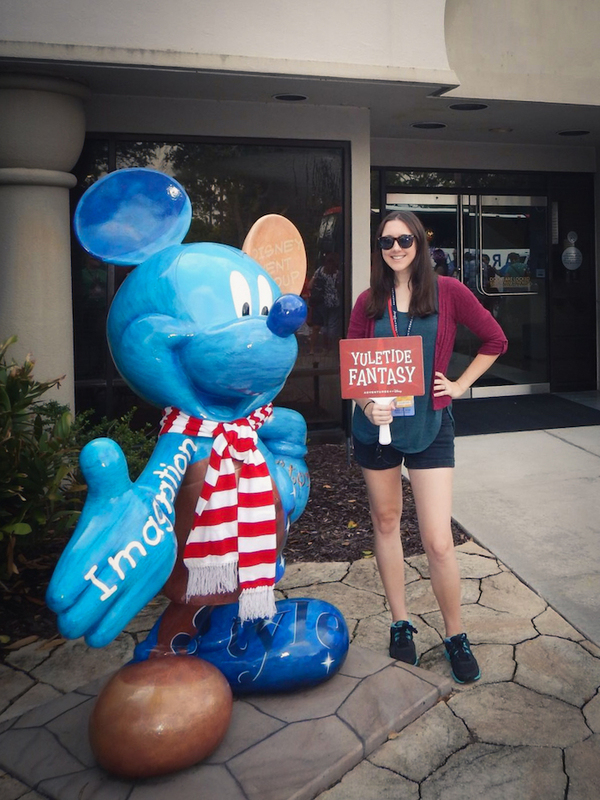 Want to learn more about special events at WDW? Subscribe today!